Cantor in the synagogue of Mihăilenĭ in Rumania; born in Brody, Galicia, 1809; died Sept., 1875. He spent his youth in his native town, where he acquired a knowledge of Hebrew literature under the instruction of Erter and Krochmal. His most important contributions in this field are twelve literary essays in vols. viii., ix., x., and xi. of the "Bikkure ha-'Ittim." He carried on a literary correspondence with Judah ben Jonah Jeiteles in "Kerem Ḥemed," ii. 183. 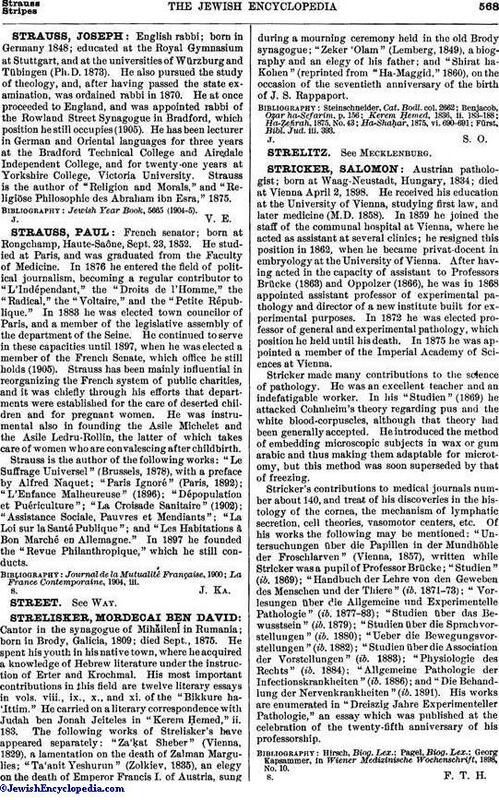 The following works of Strelisker's have appeared separately: "Za'ḳat Sheber" (Vienna, 1829), a lamentation on the death of Zalman Margulies; "Ta'anit Yeshurun" (Zolkiev, 1835), an elegy on the death of Emperor Francis I. of Austria, sung during a mourning ceremony held in the old Brody synagogue; "Zeker 'Olam" (Lemberg, 1849), a biography and an elegy of his father; and "Shirat ha-Kohen" (reprinted from "Ha-Maggid," 1860), on the occasion of the seventieth anniversary of the birth of J. S. Rappaport. Fürst, Bibl. Jud. iii. 393.